SEATTLE (AP) - A Washington state sheriff's deputy was fatally shot while responding to a report of a disabled vehicle, and authorities say they've killed the suspect. Deputy DeRosier leaves behind a wife and five-month old daughter. The sheriff's office said Deputy DeRosier was in rural Cowlitz County contacting a person related to a parking complaint when he was shot then lifeflighted for medical treatment. He succumbed to his injuries early Sunday morning. A search warrant was served at home close to where the shooting took place. However, the investigation remains active. "It is with great sorrow and sadness we announce that the Deputy killed in the line of duty in Cowlitz County last night was Deputy Justin DeRosier. 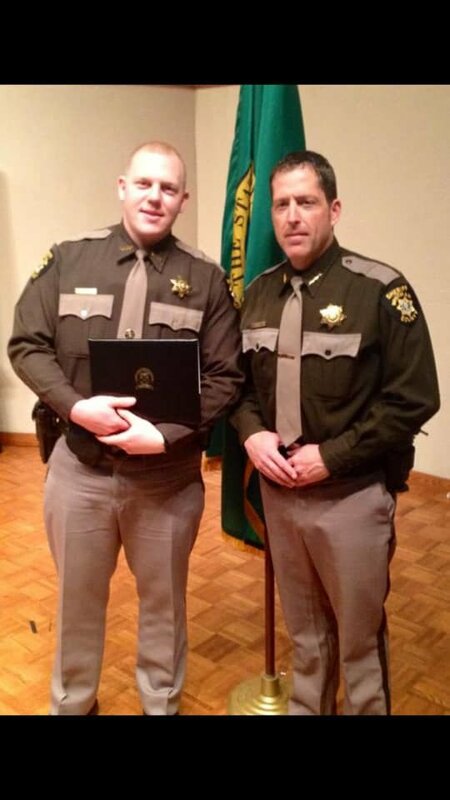 Deputy DeRosier was a Reserve Deputy and Deputy Sheriff for the Whitman County Sheriffs Office when he first started his career and later lateraled to the Cowlitz County Sheriffs Office. Our thoughts and prayers go out to his wife, daughter, family, friends and colleagues during this difficult time. We have included a picture of Deputy Justin DeRosier along with Sheriff Brett Myers." COWLITZ COUNTY - Cowlitz County Sheriff Brad Thurman says the Saturday shooting death of a deputy is believed to be a first for the county. AP News reports Sheriff Thurman told the Longview Daily News that the fatal shooting is believed to be the first death for an officer in the line of duty in the history of Cowlitz County Sheriff's Office. The sheriff's office says the deputy was in rural Cowlitz County. They were contacting a person related to a parking complaint when the deputy was shot then lifeflighted for medical treatment. COWLITZ COUNTY - A Cowlitz County Sheriff's Deputy was killed in the line of duty Saturday night. The sheriff's office Facebook says the search for the suspected shooter is still active. Residents in the area have been contacted through reverse 911 notification. More information about the deputy and the incident will be released later and this story will be updated. LONGVIEW, Wash. - Memorial information for fallen Cowlitz County deputy Justin DeRosier has been released.